News — Keisha Bahr, Ph.D.
Coral reefs are one of the most ecologically and economically important ecosystems on Earth. An estimated 85% of the United States’ reef area is located within the Hawaiian Archipelago, which was recently valued at $33.6 billion dollars annually. Reefs are the foundation to our social, cultural, and economic life in Hawai‘i. Our major industry is tourism which is dependent on the nearshore reefs. Hawaiian reefs are currently being threatened by many local and global impacts including increasing temperatures. The recent severity and extent of bleaching events pose a significant threat to the integrity of this unique ecosystem. Therefore, we propose to develop a coral health reference card to assess and quantify coral bleaching and educate the community about its impacts to Hawai‘i. To accurately quantify the change in color during bleaching, controlled laboratory studies followed by field validations and surveys will be applied. Products of this work will be used to update supporting materials for resource managers which will aid in assessment of reef resilience, bleaching occurrence and socioeconomic impact of climate change. This research will include and support community groups, students, and management agencies responsible for the State’s marine resources. Final testing and verification has been completed! Off to the printers! 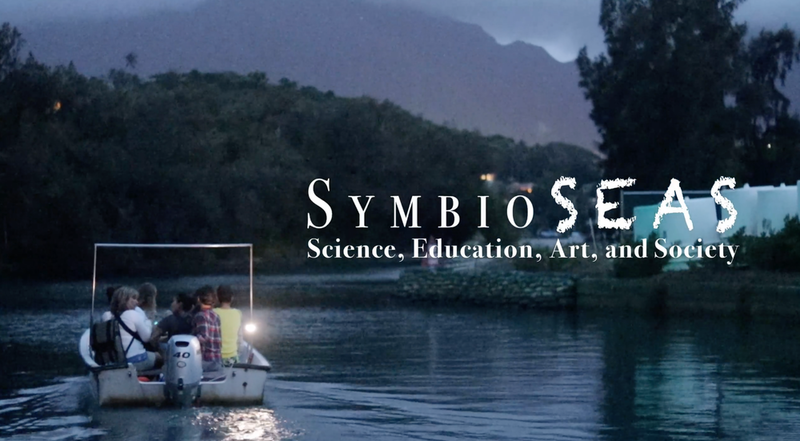 SymbioSEAS: Connecting Science, Education, Art, and Society through Coral Reefs is a locally-based art exhibit that will be on display from March 1st to 30th, 2019 at the ARTS at Marks Garage in Chinatown. Honu on the move for food! Green sea turtles are grazing their way into new areas to help control the growth of invasive seaweed in Hawaiʻi. Check our our newest paper describing the decline in Gorilla ogo (Gracilaria salicornia) in less than 30 days in the lagoonal waters around Moku o Loʻe, Hawaiʻi Institute of Marine Biology. Check out her work amazing work. Exhibit coming soon March 2019. I am currently working with a brilliant innovative artist, Jocelyn Ng, who has transformed me into one of my experiments to help communicate impacts we have on our reefs. First evidence of acclimatization or adaptation in corals to warmer waters! As our planet and oceans warm, researchers question whether corals can adjust. To attempt to answer this question, we replicated the landmark study conducted in the 1970s to determine if there has been any change to coral temperature tolerances in the last half century. In the summer of 2017, we replicated the original experiment using the identical experimental system, methodology, location, species of coral, and even one of the original researchers, Dr. Steve Coles. This provided a very unique opportunity to evaluate whether coral bleaching thresholds have changed over the past 50 years. We are currently conducting our last set of experiments to validate the Hawaiian Koʻa Color Card. The goal of this project was to provide a tool for resource managers, scientists, students, and the community to monitor the changes that are occurring on our reefs. Each color is linked to the physiological state and health of the coral. We hope to have a final product out by summer 2019. Watch the episode of Voice of the Sea with Dr. Kanesa Seraphin where I speak with her about understanding ocean warming and acidification impacts of coral reef biodiversity using Autonomous Reef Monitoring Structures (ARMS). Another great year of Field problems in Marine Biology! 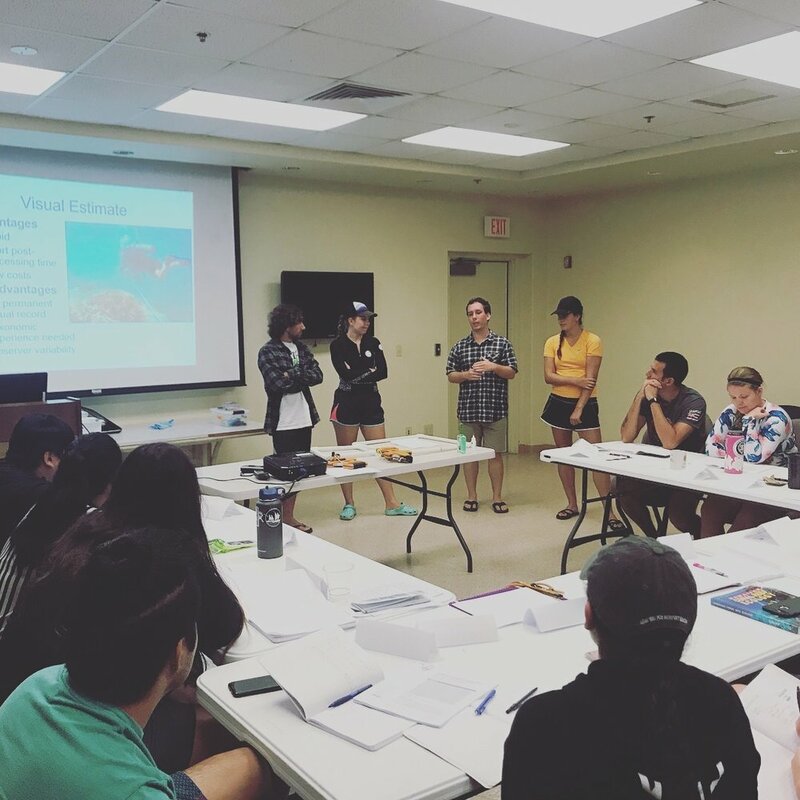 The BIOL 403 class (Field Problems in Marine Biology Presented their work to the Hawai’i Institute of Marine Biology community! Field Problems in Marine Biology is an intensive 4-week field course where students live and work at the Hawai’i Institute of Marine Biology. I help equip them with the skills they need to become the future resource managers. The 2018 cohort investigated changes in the abundance and distribution of Fungia scutaria (mushroom coral) over the past 18 years and what natural and anthropogenic factors have driven those changes. I was very fortunate to speak with the faculty and students at Santa Monica College about the impacts we have on our reefs! Warmer seawater temperatures are negatively affecting coral reefs in Hawaiʻi—and across the globe - and are tied to the drastic increases in global carbon emissions over the past several decades. During the recent global bleaching event, surveys were conducted inside Hanauma Bay Nature Preserve, to assess the impact of these warmer waters on this protected coral reef ecosystem. Approximately half of the corals bleached and despite the lack of local influences (e.g., sedimentation, fishing and harvesting pressure), some coral mortality (~10%) occurred. Continued exposure to thermal stress can lead to reduced reef complexity, coral cover, and biodiversity. Global climate change poses a direct threat to the biological sustainability of the protected reefs of Hanauma Bay Nature Preserve and a clear economic threat for the state of Hawaiʻi.